There are so many serene spots to enjoy lakeside, but for a different view, the owners often go for a leisurely paddle on The Love Boat. 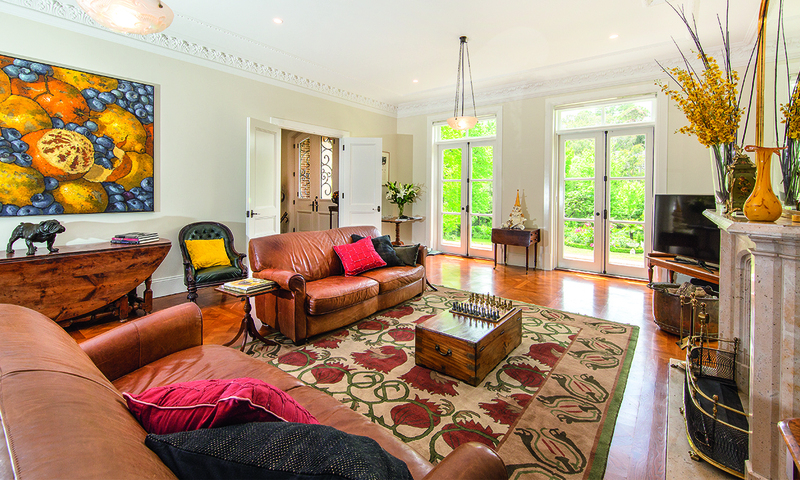 It was a fairytale scene the first time Rebecca and Peter Kennedy saw their Aldgate property. The sun was shining and baby ducklings were waddling along when they, by chance, drove past a home that had piqued Rebecca’s interest in an advertisement. The couple were holidaying overseas soon after, so the timing was all wrong to take on a new project. When they arrived home, serendipitously, the property was still on the market. The Kennedys put in an offer, which was eventually accepted because the owner knew they would take care of the garden. That they did — in spades. The balconies look out over almost a hectare of garden, transformed by Rebecca and Peter Kennedy. The formal garden closest to the house features hedging and sculptural elements, interspersed with pops of colour and fragrant roses. The rambling garden beyond has countless different pockets of interest, designed to have visitors exploring all the nooks and crannies. When they arrived, the established trees were lovely, with some real gems in the mix. However, there was work to be done with the understorey plantings. Rebecca took on the job headfirst and transformed nearly two acres into a gorgeous rambling garden offering a surprise at every turn. Views from the top of the formal garden surrounding the home stretch out to the lake, jointly owned by the Kennedys and a neighbour across the two-and-a-half-acre body of water. It was a former railways lake for steam trains, feeding a creek that trickles down to Aldgate. The lake is complete with a charming row boat and dock area, which isn’t just for aesthetics. Rebecca and Peter’s son took the opportunity to propose to his now-wife while on a night time paddle; they later held their wedding in the garden. And the craft has since been named The Love Boat. There’s no place in this garden that can’t be enjoyed. The Kennedys have multiple spots to sit and admire their hard work. The curved pathways created by Rebecca wind through daffodils, red wings, lilies and much more. Off the beaten track, there’s a certain wild aspect that gives a feeling of wandering through an untouched landscape. The Japanese garden was created from objects found around the garden when the Kennedys moved in, with a traditional gate painted a vibrant red. A rambling walk down the garden path, past some beautiful crab apples, leads to what Rebecca calls her gin and tonic area. The fern-filled gully is the perfect spot for a summer drink, kept relatively cool even on the warmest of days. If the occasion calls for bubbles, the Champagne area is on the other side of the garden, under the old oak tree next to the lake. The master bedroom was planned so it would enjoy a spectacular vista, perfect to wake up to first thing in the morning. The neutral palette is timeless and allows the antiques to shine. Wherever your vantage point, there is always something happening, no matter the time of year. Hundreds of hydrangeas in flower are a marvellous sight, and an avenue of red wing azaleas give the large-scale effect that Rebecca aspires to. There’s a real tendency towards garden rooms. A cool, shaded area is planted with tree ferns and gunnera. A Japanese-inspired zone was constructed with items found within the garden, and Japanese maples are dotted throughout. The Kennedys can lay claim to having the tallest Wollemi pine (Wollemia nobilis) in the state, according to the Botanic Gardens of South Australia. The ancient tree was believed to be extinct until 1994, when it was discovered in the Blue Mountains. A hidden garden is taking shape — once grown and pruned perfectly, hedging will conceal a private and more formal grassed area. With so much water on the property, there are four bridges to choose from across the streams, including the Monet bridge, named for its likeness to the one in the famous paintings. The bathrooms provide all the mod cons, but still with classic styling. Marble tiles from Italia Ceramics add another layer, while a Routleys bathtub creates a point of interest. Wide shutters bring in that touch of the French countryside, so prevalent throughout the home, and offer privacy. There’s no real structure or order to the garden; the idea is to wander along, discovering something new every few steps. “When I started to do the edging, the gardener got his stringline out and was going to make it completely straight. I said, ‘don’t worry, there are going to be rambling curves’.” Kilometres of edging weaves through the garden, leading back to the formality of the lawn and roses at the top. The Claude Monet and Perfume de Paris Delbard roses emit a lovely fragrance, and tie in nicely with the Kennedys’ French-inspired maison. Originally on the property was a two-bedroom besser block 1960s house, which was demolished to make way for the new build. But the owners weren’t tempted to go ultra-modern, tending towards a more heritage feel instead. Furniture and fittings have been collected by Peter and Rebecca over the years. A more modern art collection pops, but lives harmoniously with traditional elements. The chairs in the informal dining room were owned by Rebecca’s mother, and happened to work perfectly in their home. 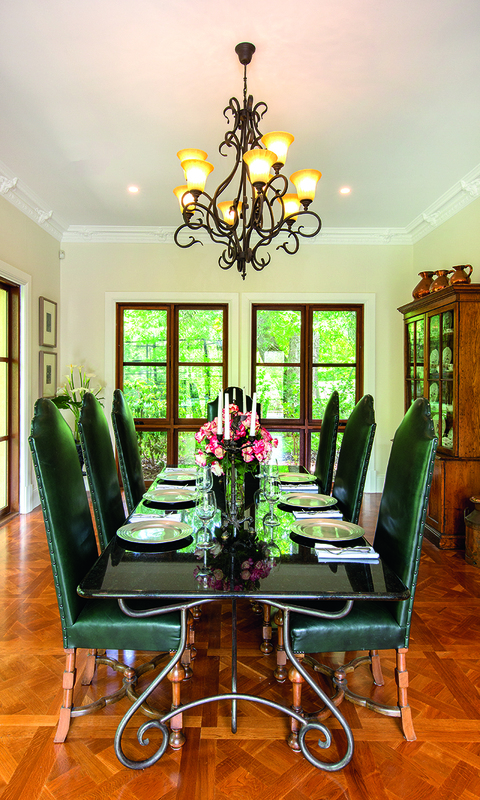 The formal dining and sitting room features an ornate fireplace, and the intricate cornices found throughout the home. 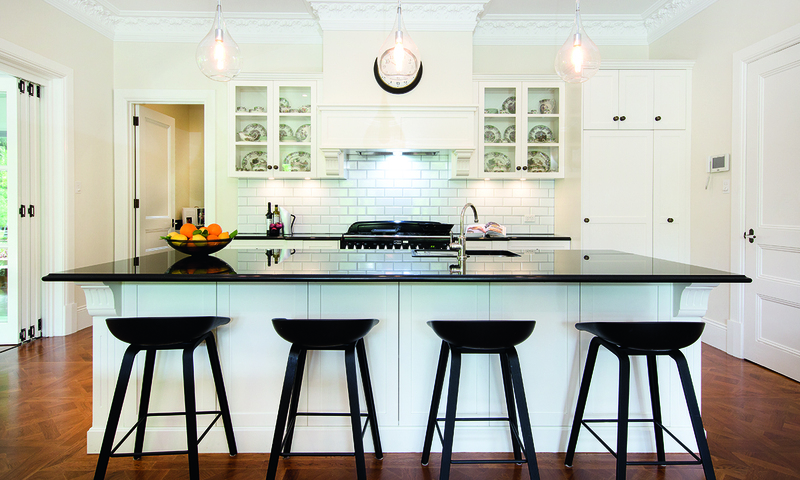 The kitchen adds a contemporary twist, with monochromatic styling and clean lines. The kitchen shares an open plan space with the informal living room. The Jetmaster fireplace warms the entire area, with double glazing on the windows ensuring the Adelaide Hills chill doesn’t creep in over the cooler months. The home’s grand symmetrical exterior is intricate in its detailed aesthetic. From the ornate metalwork designed by Peter and Rebecca themselves, to the trees and plants carefully chosen to frame the house. The level of attention continues in every room throughout. Peter, having been in the construction industry for 40 or so years, was intent on having every detail thoroughly considered before work began. “We went right through and selected everything: what we were going to have, how it was going to look,” Peter, chair of the Carrick Hill Trust, says. “We put it all together and put that out to tender.” Aura Custom Projects were the ones to undertake the build, with close supervision from Peter himself. The home has won awards from both the Housing Industry Association and the Master Builders Association of South Australia. The outdoor area was taken into consideration in many ways. A two-storey design was chosen to maximise garden space. The main living spaces all face out to the most desirable vistas, and Rebecca chose the perfect spot for her bedroom and positioning of bed so she can roll over in the morning and admire her garden even before getting up. French doors open the home to the formal garden and beyond. 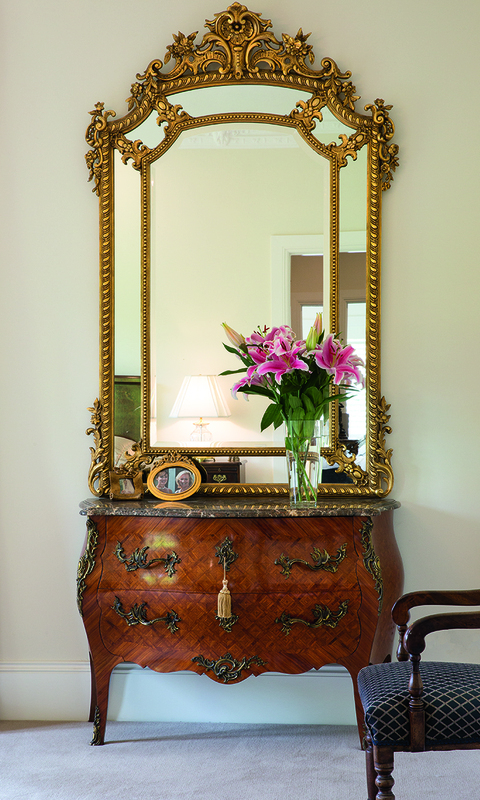 Having been antique collectors for more than 35 years, the Kennedys have used French antique furniture and fittings throughout their home. 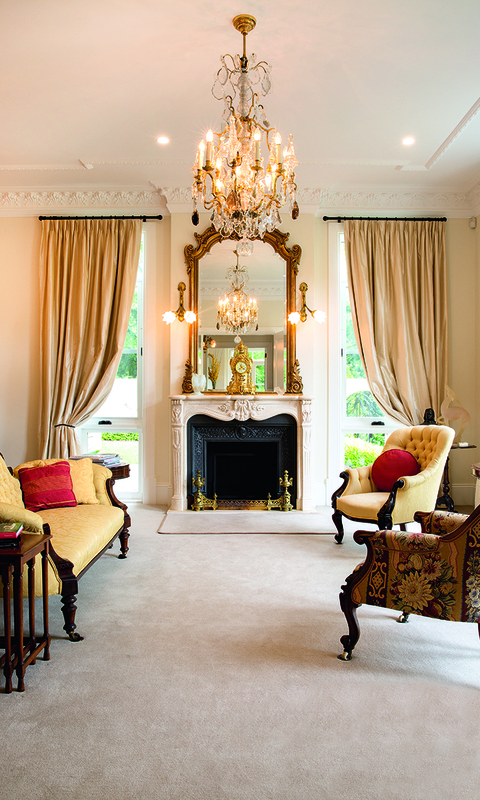 Grand fireplaces and mirrors in golden tones sit perfectly among armoires and chandeliers. European oak parquetry in a Marie Antoinette design sits underfoot, while up above, ornate cornices adorn the 3.3-metre ceilings. French doors surround the home’s exterior, allowing the interior to be bathed in light. The biggest compliment the Kennedys receive is when people enquire how old the home is, thinking the property has been renovated, rather than newly built by Aura Custom Projects. Even the spaces that have been given a more modern touch retain the home’s overall theme in some way. The bathrooms are bright and white, but French shutters and touches of marble steer them away from stark. The kitchen’s monochrome palette and pendant lights add a dash of modernity, but the carefully selected joinery takes it back to classic. More touches of the contemporary creep in through the couple’s art collection. The formal living area is decorated with two large scale and fairly controversial paintings by Archibald winner Fred Cress. It’s no surprise that when guests come to stay, they rarely want to leave. Their first guest in the home was Tim Wonnacott, of Antiques Roadshow fame. 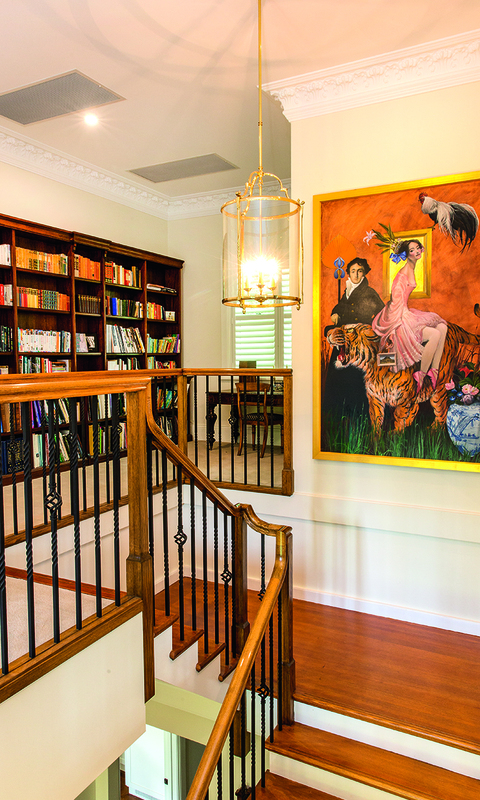 He told the Kennedys he rarely covets things anymore, but made an exception for a colourful painting by Adelaide Hills artist, Stephen Trebilcock that hangs in the informal living area. The biggest compliment the couple can get is when visitors ask about the age of the house, assuming it has much more history than it does.